This Marvel train ain’t stopping for anything! 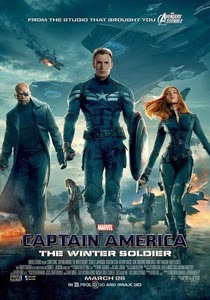 The Winter Soldier is quite possibly one of the best entries into the film series yet! Captain Steve Rogers tries to find a sense of place in the modern world working for S.H.I.E.L.D. But when Nick Fury is targeted by a mysterious assassin, Rogers discovers that his patriotism could just be used as a pawn for corrupt political forces. Captain America, as a singular character in the current Avengers team, has the most groundwork and the most to build upon in a sequel. There’s a lot to work with! Tony Stark and Thor had mostly completed stories when going into their sequels, but the Captain did not; he’s been left untouched since his debut in 2011. This is a great boon for The Winter Soldier. The film opens with a very stealth driven action sequence with the Captain and Black Widow taking on a terrorist takeover at sea. This is heralding more to come; the film’s entire storyline is about espionage, spy networks and ambiguous political intent. The story is intelligent and interweaving, frequently summoning up ghosts from Steve Rogers’ past, but in no unlikely manner, in fact the linkage with The First Avenger is were a lot of the film’s intensity comes from. That and its not-so-heavy-handed social and political subtexts. Of course, it isn’t all talking and mystery (though I was surprised at how moody the film became) there is still plenty of action. The Winter Soldier himself is an excellent addition to the Marvel mythos, the soundtrack adding to the foreboding atmosphere around him and the film shows how deadly he really can be. The Captain too gets a much better sense of strength here too (I’m sure I’m not the only one who felt he was a little underpowered in Avengers Assemble) being thrown about, running through walls, using his shield in such marvelously silly ways. It is greatly entertaining when the bullets and punches start flying. It is also a surprisingly brutal film. With Captain America’s origins and current story trapped in comparatively realistic settings (we are dealing with countries, governments and spies, not gods and space aliens) even to Iron Man standards, the action is intense and scenes get quite dark. People are shot, often viciously, they are wounded, they bleed, even tortured. A clear sign that Marvel aren’t only delivering more mature content, but are confident in doing so. That said, there’s a healthy sense of humour in there too. Maybe not as riotous as some of Tony Stark’s adventures, but it is there. I have trouble thinking of what’s wrong with the film. The action scenes sometimes fall into a lot of shaky camera work, again, but other times it is fine. This could be due in part to the 3D, which I had no time for; just see the film regularly, the 3D does nothing. Some of the plot might seem predictable, but I imagine the younger audiences will be totally captivated. All in all a great movie, and it stands alone and as an Avengers continuation very well! What is remarkable is that Marvel is successfully giving each of its character’s movies a distinct theme and mood. Like reading the different comics, there is a difference. You know you are watching Marvel, but the heroes have their own presence and strength to give. Additional Marshmallows: As if you need to ask, yes there’s two extra clips during the credits! Like with Thor 2, there’s an important, longer clip after the initial “graphical credits” (connotations to Avengers 2: Age of Ultron!) and then a shorter, slightly less important clip after the regular credit role. However, the credit role isn’t too long.